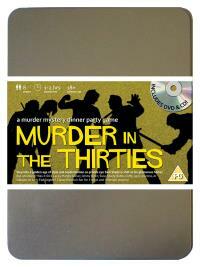 You've been invited to play the role of SUSO SHADY in Murder in the Thirties. Who shot Sam Shady? Rooseville, 1931. Sam Shady, private eye to the stars, is celebrating his birthday in style. He’s invited all his current clients, as well as his closest rival, to dinner at his classy house. As his guests are getting to know each other before the first course arrives, Sam steps outside for a quiet smoke and shortly afterwards, he is found lying dead in the middle of his lawn. Find out who made Sam’s birthday go with a bang! Sam’s Chinese wife (she’ll show you her lotus blossoms!) Costume : Proud of your heritage, you wear an oriental-style dress in a fiery colour (to match your fiery personality!) You choose simple jade jewellery and weave an exotic flower into your hair for that finishing touch. Your make up is striking in bold colours. Your spiked heels could be classed as a dangerous weapon. The formidable and alluring daughter of a wealthy Chinese businessman, you met and married Sam seven years ago when you first arrived in the country. You have been considering opening your own oriental rug shop and were looking forward to asking Al DaBone how his chain of pet shops have become so successful.